This integrated application is ideally suited to help attendees navigate large complex events so they don&apos;t miss content or opportunities to meet other attendees, sponsors, and subject matter experts that specifically align with their goals and objectives. "I&apos;m very excited about our partnership with Zerista. Now Validar can deliver tools to help Event Marketers assure that their attendees are getting the very most out of their event live during the event. 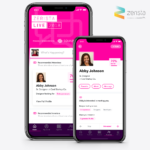 Also, by integrating our EventHub mobile feedback application into Zerista, we can deliver session evaluations live that directly align with each individual attendees actual participation from one tab. Event Marketers are always looking for ways to drive a higher evaluation response rate and more "call to action" conversions", says Victor Kippes, CEO of Validar. "Zerista is committed to providing the very best experience for all event attendees," said Tyler Conley, Vice President of Sales for Zerista. "Our partnership with Validar provides additional tools to personalize each attendee&apos;s experience and help them connect with the people and information they need most." To learn more about Validar&apos;s registration and attendee behavior tracking solutions visit http://www.Validar.com.